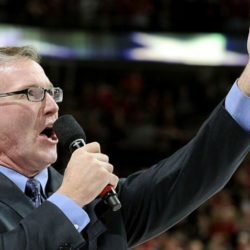 Jim Cornelison is recognized in the Chicago area and across the country for his role as the “anthem singer” with the Chicago Blackhawks NHL franchise and as a new face of the Indianapolis 500, but how did he get there? How does he stay focused, calm and compelling when performing for live audiences ranging from 200-2,000,000 and when being interviewed by local and national media? How does he take his very focused and repetitive work of performing the anthem and put it to work to grow his brand and business and assist other individuals, businesses, organizations and causes across the United States? Find out the answers to these questions and more when Jim sits down with Dafna to chat about the “attitude and action” he developed and applied to reach his personal and professional goals. In addition to facilitating the discussion with Jim, Dafna will share helpful anecdotes learned from her work with professional athletes from all the major sports and interviews with coaches and team leaders. What may surprise you is what she has learned about the incredible value placed on accountability, adaptability, resilience, handling of adversity and a consistent competitive edge. While we hear so much about the focus on metrics and statistics in professional sports and business, these human characteristics are consistently cited as the determining factors between being good or being great. In the end, we all perform our own “anthem” in our respective professional and personal endeavors. Hopefully, you can apply some of the insights and information from an evening with Jim and Dafna to fine tune the “attitude and actions” which will help take you to and keeps you at the top of your game!